Uniformed customer experience across all touch points is one of the foundations for consumer satisfaction. 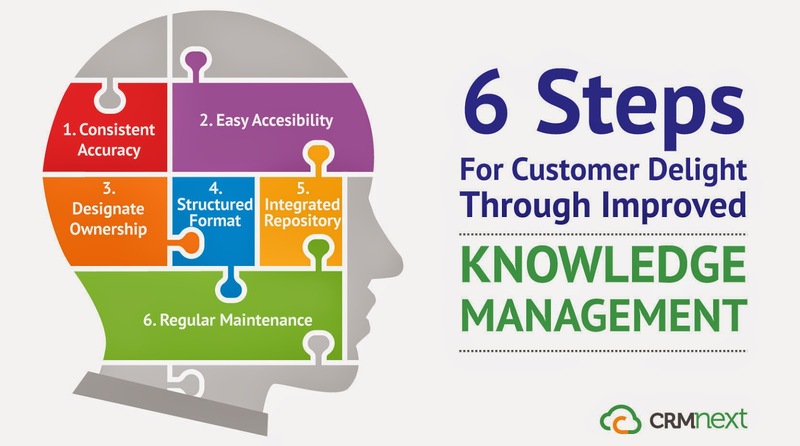 How can you better your knowledge management to improve customer service? Your brand will have multiple touch-points like web, email, internal repositories, mobile etc. How will customers feel when they come across multiple variations/wrong versions of the same information? Confusion and erosion of trust, confidence; which is not good for customer engagement. Hence, it is very important to have accurate and consistent information across all your portals. Correct information will lead to knowledgeable executives, who in turn, satisfy customers with prompt responses. Core issues/updates related to the product/service should be addressed and updated in the knowledge management repository. What is the use of a well maintained content library hidden in a nook corner of a portal? There would be no accountability without responsible ownership. Allocate content responsibilities to competent individuals who will take care of regular updates, formatting and credibility checks etc. You can even formulate areas of improvement with the help of these individuals. Delegating such ownership will also enhance product knowledge confidence amongst employees and avoid inconsistencies, data inaccuracies etc. It is better to have a uniform and structured content format for your knowledge base. This will make creation and distribution of content much easier. Uniform structure transforms to easy reading for the visitors. Important points can be retained with the help of a well-defined knowledge management format. As an organization grows, different channels will have separate knowledge repositories. This creates siloed knowledge banks with orphaned and obsolete content. Maintenance activity on such multiple repositories can be tedious, expensive and complex. To ensure fast access and high quality, it is important to have centralized knowledge repositories. Businesses are getting more awareness about the benefits of having such system by buying integrated CRM suites (implementations rose by as much as 6% in 2014). Save costs and valuable time by having a centralized knowledge management system that integrates all channels of communication. You should always take steps to ensure that your knowledge management system face as little downtime as possible, that is possible only by regular maintenance. Having a maintenance schedule can mean keeping your CRM software platform up-to-date, continuous review by content owners, updating knowledge bank based on ratings, feedback, usage analytic etc. By implementing the above steps, you can have a fast, accurate and agile knowledge management system which your employees and customers can use to satisfy their need for information. Switch over from a siloed knowledge base to a centralized system powered by an integrated CRM Solution. Brands listen to our customer service blog to get taller, faster!